Srīmālā said, “Very well. World-Honored One. The embracing of the true Dharma is called the Mahayana. Why? Because the Mahayana gives birth to all Sravakas and Pratyekabuddhas, and all mundane and supramundane wholesome dharmas. Just as Lake Anavatapta is the source of the eight rivers, so the Mahayana produces all all Sravakas and Pratyekabuddhas, and all mundane and supramundane wholesome dharmas. Mahayana: the Great Vehicle. Later we will see how this, in terms of the sutra, is synonymous with the Absolute body of the Dharmakaya. The Great Vehicle here contains all others. “World-Honored One, just as all seeds, grasses, trees, and forests depend upon the great earth in order to grow, so all Sravakas and Pratyekabuddhas, and all mundane and supramundane wholesome dharmas, depend upon the Mahayana in order to grow. Therefore, World-Honored One, to abide in and embrace the Mahayana is to abide in and embrace [the vehicles of] the Sravakas and Pratyekabuddhas, and all mundane and supramundane wholesome dharmas. Scholars continue to ponder the true meaning behind what is exactly the nature of the “One Vehicle”. Could it be the Bodhisattva as opposed to the śrāvakayāna or pratyekabuddhayāna? Or is it simply in reference to the “Great-Vehicle”, or Mahayana? Or even perhaps the One Dharma that encompasses them all? The fact remains that the Lotus Sutra never explicitly defines it; it does however give broad hints that whatever its true variable is, it rests solely in leading all people to attain Buddhahood. At this junction I’m going out on a limb and conjecture that the One Vehicle=Buddha-nature. I believe that the ongoing study of the sutra will support this thesis. Indeed, this One-Vehicle is meant to supplant the former-three, which had provided provisional expedient means to enlightenment but never quite satisfied the Core Element of Buddhism itself which can be argued, in particular through the latter Ch’an schools, that the Bodhikaya, or the fully awakened Body is non- other than the One Mind, or one’s innate Buddha-nature. We shall also soon realize that the “Great-One-Vehicle” IS Self-Realized as the Absolute Buddha Body of the Dharmakaya; in particular AS Tathagatagarbha that is within all sentient beings AS their Buddha-nature. Namely, the abiding of the true Dharma, the extinction of the true Dharma, the Pratimoksa, the Vinaya, true renunciation of the household life, and full monastic ordination. lt is for the sake of the Mahayana that these six subjects are taught. Why? The abiding of the true Dharma is taught for the sake of the Mahayana because the abiding of the Mahayana is the abiding of the true Dharma. The extinction of the true Dharma is taught for the sake of the Mahayana because the extinction of the Mahayana is the extinction of the true Dharma. As for the Pratimoksa and the Vinaya, these two Dharmas differ in name, but mean the same. Vinaya is instruction for the Mahayana. Why? It is for the sake of Buddhahood,[which is the aim of the Mahayana,| that one leaves the household life and receives full monastic ordination. Therefore, the Vinaya, true renunciation of the household life, and full monastic ordination are all Mahayana disciplines. ”At this time, the evil monks will buy and sell slaves to till their fields and to slash and burn the mountain forests. They will do harm to living creatures and they will feel not the least bit of compassion. These slaves will themselves become bhikshus and maidservants will become bhikshunis. Totally lacking in Way-virtue, these people will run amok, indulging in licentious behavior. In their turbid confusion they will fail to separate the men from the women in the monastic communities. From this generation on, the Way will be weakened. Fugitives from the law will seek refuge in my Way, wishing to be shramanas but failing to observe the moral regulations. Monastics will continue to recite the precepts twice a month, but in name alone. Being lazy and lax, no one will want to listen any longer. These evil shramanas will be unwilling to recite the sutras in their entirety and they will make abbreviations at the beginning and at the end of the texts as they please. Soon the practice of reciting sutras will stop altogether. Even if there are people who recite texts, they will be unlettered, unqualified people who will insist, nonetheless, that they are correct. Bumptious, arrogant, and vain, these people will seek fame and glory. They will put on airs in the hope of attracting offerings from other people. “World-Honored One, the Arhats do not [truly| leave the household life or receive full monastic ordination. Why? Because it is not for the sake of Tathagatahood that they leave the household life or receive full monastic ordination. “The Arhats take refuge in the Tathigata out of fear. Why? The Arhats are constantly afraid of all phenomena, as if someone sought to harm them with a sword in hand. Therefore, they do not actually accomplish the deeds of renunciation, nor do they attain the ultimate bliss. World-Honored One, [he who does not need] a refuge does not seek a refuge, just as sentient beings without refuge are afraid of this and that and seek refuge For the sake of security and peace, so, World-Honored One, the Arhats take refuge in the Tathagata out of fear. Mahamati said: Now, the Blessed One declares that there are three kinds of Arhats: to which one of the three is this term “Arhat” to be applied? To one who makes straightway for the path of cessation? Or to one who neglects all his accumulated stock of merit for the sake of his vow to enlighten others? Or to one who is a form of the Transformation Buddha? Replied the Blessed One: Mahamati, the term “Arhat” applies to the Sravaka who makes straightway for the path of cessation, and to no others. Mahamati, as for the others, they are those who have finished practicing the deeds of a Bodhisattva; they are forms of the Transformation Buddha. “Thus, the Arhats and the Pratyeltabuddhas have not ended their rebirths, have not sufficiently cultivated pure conduct, have not accomplished what should be accomplished, and have not completely eradicated what should be eradicated; they are still far from nirvana. Why? 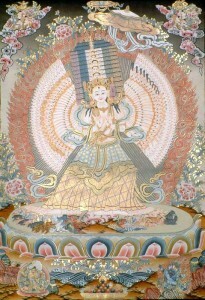 Only the Tathagata, the Worthy One, the Perfectly Enlightened One, has attained nirvana; has achieved all the infinite, inconceivable merits; has eradicated all that should be eradicated; is ultimately pure; is adored by all sentient beings; and has transcended the states of the two vehicles and of the Bodhisattvas. The Arhats and so forth have not done so. It is only as skillful means that the Buddha speaks of them as having attained nirvana. Therefore, they are still far from nirvana. Only the Tathagata: Wayman’s text refers this as Tathagata-Arhat-Samyaksambuddhas. A better reference with nirvana here ought to be parinirvana—unexcelled, complete and final nirvana, that is only realizable by the Tathagatas. “World-Honored One, when the Tathagata says that the Arhats and Pratyekabuddhas have an insight into liberation, thoroughly possess the four knowledges, and have attained ultimate relief and rest, he is speaking of the expedient truth in order to accommodate others’ inclinations. Why? There are two kinds of [birth and] death. What are the two? They are the recurring |birth and] death and the transformational [birth and] death. The recurring [birth and] death are the [birth and death of] sentient beings who continue [to exist in samsara]. The transformational [birth and] death are [the birth and death of | the mind-created bodies of Arhats, Pratyeltabuddhas, and liberated Bodhisattvas, which they retain until they attain bodhi. Now, of the two kinds of [birth and] death, it is with regard to the recurring [birth and] death that the Arhats and Pratyekabuddhas are said to know they have exhausted their rebirths. Because they have realized the incomplete fruit, they are said to know they have fully cultivated pure conduct. Because they have thoroughly eradicated the continuous defilements—which cannot be accomplished by any ordinary people or by the seven grades of learners—they are said to know they have accomplished what should be accomplished. “With his mind thus concentrated, purified, and bright, unblemished, free from defects, pliant, malleable, steady, and attained to imperturbability, he directs and inclines it to creating manomaya-kāya. From this body he creates another body, endowed with form, made of the mind, complete in all its parts, not inferior in its faculties. The seven grades of learners: those who are approaching the fruit of a stream-enterer, and those who have obtained it; those who are approaching the fruit of a once-returner, and those who have obtained it; those who are approaching the fruit of a non-returner, and those who have obtained it; and those who are approaching the fruit of one beyond learning, i.e., an Arhat. This entry was posted in The Lion's Roar of Queen Śrīmālā and tagged Arhat, Arhats, Dharma, Mahayana, manomaya-kāya, Pratyekabuddhas, Ultimate Extinction of the Dharma Sutra. Bookmark the permalink. So that’s the source of the often repeated claim that the Shurangama Sutra will be the first to disappear! Seen that claim before but never read the Dharma-Extinction Sutra itself (I shorten its name here). seems to me that the “manomaya-kāya” is almost a taboo topic; it is seldom if ever discussed in the West (not sure about the East). Good to learn more about it. Looking forward to reading that new addition to the Library when the time is right for me to study it. At this juncture it seems to be too advanced for me. But it certainly fascinates. Yes, the manomayakaya can get rather sticky. The resource is excellent; it breaks it down into philosophical, psychological, ontological, and ascetical categories. There is frequent reference within these blogs–where it takes on a more spiritual component. Do a search here sometime, the study of it is fascinating.